Can you see his friend? Photo taken in Chobe National Park in Botswana. This entry was posted in Travel Photos and tagged 50 Year Project, Africa, Blog, Blogging, Botswana, Chobe National Park, Giraffe, Nature, Photography, Travel, Travel Blog, Travel Journal, Travel Photo, Wildlife. Bookmark the permalink. He’s tiny so I can understand. there’s a bird on his neck. The bird and giraffe seem like best buds. 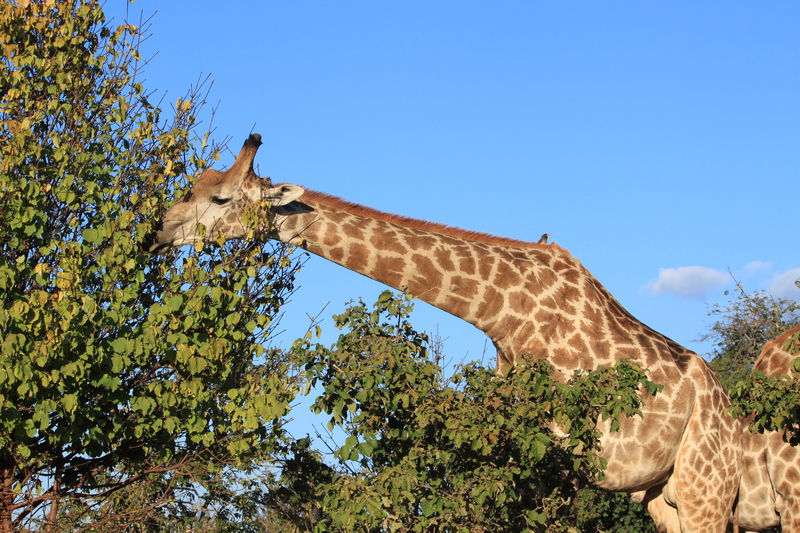 Not often that you get to take a shot of a two-tummied giraffe! Well done. Yes, you can just about spot the buddy in this shot but for a moment it looked like you’d done something clever Photoshop! but you have to for people like me who can never figure out the mystery. I like to look at the patterns on the giraffe. Nice photo. I kept staring at the patterns on the giraffes and the zebras. So cool! Yeah, but, I had to look a bit-neat shot! It is tiny compared to the giraffe. The little bird eats the ticks and such off the giraffe. He’s sticking his neck out for ya!! Ha! Yes, a little feathered friend! Awww…that’s so cute! Both benefit from the friendship. Great shot! I love how matter-of-fact the giraffes are in their day to day life and how they just stroll without the slightest worry in the world. Africa is beautiful and you’ve done justice in capturing a part of her! Africa is an amazing place…I can’t wait to go back and explore more of it. All of the animals are so majestic and I didn’t want to leave. Can’t believe it’s been two years since I was there. I know. Africa does that to you doesn’t she? You’ll be back soon enough. Just think of all the splendour and magic that awaits you on your return there. Very exciting! I feel like Africa hypnotized me and is waiting for me to come back–but not to break the spell, but to enhance it.